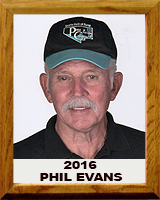 Phil Evans has contributed to the Pima County Sports Hall of Fame volunteering as host of the PCSHOF Museum over the past 5 years, and by being active in supporting the annual induction ceremony of new honorees to PCSHOF each October. Evans graduated from Rincon High School in 1964. He earned BA’s in Spanish and Secondary Education (1962 & 72) and a MEd in Counseling (1984) from the University of Arizona, as well being one of the first graduates of the Athletic Coaching Mentor Program. Evans coached football, wrestling and track at Canyon Del Oro Junior High School (1972-74). In 1985 he returned to teaching and coaching. He was basketball coach at Wakefield Junior High School (1985-86). Moving on to Tucson High School, Evans was Co-junior varsity baseball coach working with Varsity Coaches Tom Lundy, Oscar Romero and Willie Morales, Sr. at the end of the season. The Badgers were “back-to-back” State Champions (1987 & 1988). In 2009, 37 years later, Evans was an active supporter of the CDO Baseball Team. Led by Coach Len Anderson, the Dorados were State Champions. Over 4 seasons (1972, 1987-88, 2009), he was proudly associated with 3 State Championship teams and one State Semi-finals team. Evans is a member of the Southern Arizona Retired Coaches & Officials Association. He has been a volunteer member of the Tucson Rodeo Committee for over 20 years.